When you type in ‘Whitechapel’, an American deathcore band from Knoxville, Tennessee pops up in Google instead of the real Whitechapel, ‘deathcore’ being a type of thrashy music performed by middle-aged men who like to pretend they’re edgy. But Gentle Author‘s stash of rare market photos in the press yesterday reminded me that the actual East End neighbourhood of Whitechapel (seen above, 12 years after the murders) is still unable to escape the curse of the Ripper, from TV shows like ‘Penny Dreadful’ and ‘Ripper Street’ to tours creeping around the Eight/Ten Bells pub (it changed its name) looking for signs of Jack. Ripperology is the ultimate dead end; there’s nothing left to see or say, whether it’s Patricia Cornwell ripping up a valuable painting to look for non-existent clues or poor befuddled Bruce Robinson setting out to debunk Jack and ending up sucked into his own nonsense. Meanwhile, events in Las Vegas would suggest that one Mr Stephen Paddock has just earned his place in the history of mass murder – but he won’t. Why? Because, like skyscrapers outbidding each other in height, there will be a bigger one along shortly, because Vegas is a simulacrum which doesn’t have the redolence of creeping Victorian gothic that the Whitechapel band is trying to emulate, and because instead of a president who demands gun control there will only be witless talk of ‘evil’ and ‘prayers’. ‘We know nothing at all about him beyond the fact that he was probably left-handed and literate enough to write a letter. All the crazy people who are convinced they know who committed the murders, all the suspects, all the clues from the writing on the wall to the note the Ripper sent the police, they all amount to nothing. And that is why he is remembered, not for what we know but for what we don’t know, and that is why we are detectives, because we always want to finish the picture. Every case is an unfinished picture, and only we can find the missing pieces. And now I must tell you the most terrible part of the Ripper’s secret. The legend of Jack the Ripper has been kept alive all these years. There are nearly four thousand books on the subject. The Ripper breathes and walks almost as if he was still flesh and blood, when he should have been allowed to die long, long ago. His victims were desperate, poor women who could not earn enough to find a bed for the night or a hot meal. Their skin was grey and saggy from a diet of potatoes. They tramped the streets for twenty hours a day, in rain and snow and fog. They were beaten up and treated cruelly for doing nothing more than trying to survive in a mean world that didn’t care if they lived or died. Well said chris, for far too long he has been glamourised. One of my favorite Bryant monologues. I read it several times, first uttering “amen, Arthur”, and next, “Thank you Mr. Fowler”. Why do so many have so much so backwards?? This is true not only of the assassin in Las Vegas. I see it happen every day here in Italy. 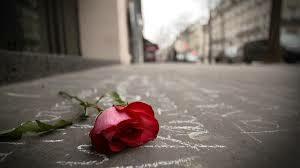 When women are raped or murdered, all the attention is given to the offenders and murderers. More often than not, the victims are bullied and/or criminalised for “improper behaviour”. This is often the case even in courts. I believe that awful pilot who flew into the mountains must have killed more but, please, please, would these dreadful men just kill themselves first and not last. No, Vivienne, they won’t because they “have to” lash out at society first, make sure everyone sees how “unfair” their life has been. How others suffer is immaterial to them. I thought that monologue of Arthur’s probably summarised how new police recruits feel about their jobs. One can only hope the feeling lasts. By the way, are those wagonloads of hay in the street? Fascinating picture. 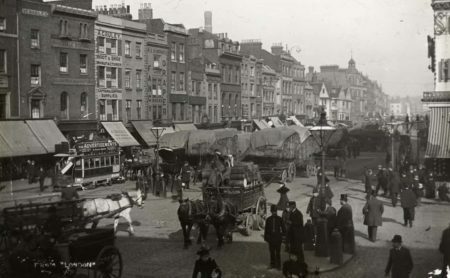 Yes, it’s a hay market – hence the Haymarket street in central London. Surely Chris the Ripper “legend” has much to do with its timing? A much wider readership of newspapers existed because of a population with many more readers than there had ever been before (As a result of The 19 C Education Acts.) The newspapers cottoned on to the serial killers ability to shift papers and the whole thing spiralled on from there. Lets just shift focus for a moment from the “Ripper” to one of the victims “Liz Stride” who was born Elisabeth GUSTAFSDOTTER in Sweden and came to Britain with her parents. Stride often claimed to have been a victim of The Princess Alice pleasure boat sinking of the Thames in 1878. She claimed to have lost her husband and most of her children in this tragedy. In fact her husband died of TB in a workhouse in the 1880s and they had no family. This poor unfortunate will forever be connected with the Ripper. She suffered a terrible, terrible death at the end of a difficult life. Each victim had their own story. Maybe it helps to think of them or is it just another slant on the exploitation of their suffering? Jan, I think you’re right about the timing. There’s a lot you can blame on literacy and poor taste is one. I’m not sure that looking at the victims is helpful since they can’t provide cautionary tales. There’s little point in telling girls not to be poor or unemployed or homeless or abandoned, let alone not to be out on the streets at night. The only point would be if the tale prompted authorities to be more concerned about living conditions and income. A previous post, ‘Design At The Crossroads’ has a picture of a London pub, The Bricklayer’s Arms. Is this not the very same boozer owned by the Kray Twins? They were, and still are, seen as folk heroes. A lot of gangsters are still held in some kind of affection. Is this, like Sir Henry Rawlinson’s ‘wrinkled retainer’, Old Scrotum, out of fear or respect? A friend of mine went on one of ‘Mad’ Frankie Fraser’s bus tours of the grottier corners of London, and said it was worth every penny, and ‘Mad’ Frankie was a damn sight funnier than a lot of ‘proper’ comedians. Hmm. A song, a few jokes, and I’ll finish up by nailing your feet to the floor. It’s odd how only a few criminals get the celebrity treatment (probably a good thing, actually) – there are no Dr Neill Cream pubs, or Neville Heath bus tours, or even George Chapman beer mats. An English comic – I have a feeling it might have been ‘Whizzer and Chips’ featured, for many years, a comic strip starring the truly evil Victorian cat-burglar, Charles Peace. Yes, really. And he was the strip’s hero! He was resurrected, several years back, for Moore and Reppion’s ‘Albion’ series, which is well worth a read. The cult of celebrity seems to embrace wrongdoers. I loved the dark comedy/horror ‘The League Of Gentlemen’, and I’m slightly ashamed of what drew me into it – it was the original radio show, ‘On The Town, With The League Of Gentlemen’ I was at work with it on, and there came a sequence where a character goes into a fancy dress shop to get a mask for a ‘fun run’. He’s told by the owner that all the good masks have gone, and the only ones he has left… are Fred West ones. I started laughing at this, simply because of it’s terrible wrongness, the dreadful mental image that such an item should be available. Good thing that Raffles didn’t come on later or he would have partaken of some of the black hero worship.